As my Nieuport Sesquiplane is nearing completion and whilst Tamiya's X-22 gloss varnish dries off (what a fantastic product ! Beats hands down any floor polish ), I have decided to start another project. I must be a glutton for punishment, as I have chosen another vac-form kit. But whilst the AirCraft kit was well engineered, this one is from Combat Models and promises to be a more ... manly endeavour . I have chosen a difficult subject, with plenty of struts, a parasol wing, floats, large transparent areas, a landing gear, a visible single P&W R-985 Wasp Jr engine... Plenty of reasons to hit a brickwall during the course of the project, and an absolute certainty that it will not be finished before the end of this GB : the Sikorsky S-39, the small brother of the iconic twin-engined S-38. I just love its unique shape, with the parasol wing, twin-booms, the central float fuselage with side floats. A typical "Art-Deco" creation ! But I would not be contented by just a difficult build. Out of the 21 S-39s built in the 30's, the most famous of all is Martin and Osa Johnson's "Spirit of Africa", c/n 914, registered NC 52V. With a larger S-38, they used it for expeditions to Africa (South Africa and Kenya in 1933/34), and Borneo (1935/36). They then sold it, it was owned by an airline in Tucson, AZ, (G&G Airlines) between 1939 and 1941, and then enlisted in 1941 in the Civil Air Patrol. This is where it met its end, on Armistice Day 1942, when it successfully attempted to rescue the pilots of a downed Fairchild 24, in the middle of 20 to 30 feet high waves raging across the Gulf of Mexico. A lateral float was damaged landing in the rough sea, making a take-off impossible. Towed by a USCG cutter, it sank in the evening, in the middle of the Gulf. What makes NC 52 V even more special was that it was engined with the P&W R-985 Wasp Jr #2, which flew successively, before being installed in the "Spirit of Africa", in the Vought O2U-1 Corsair prototype, then the Laird Solution that won the Thompson Trophy race in 1930 (but not in the race specifically) then the Gee Bee Z racer that won the Thompson Trophy in 1931, then the Gee Bee R-2 of the 1932 Thompson. So plenty of reasons to have a go at this one . If you want to see what the kit looks like, let me refer you to the LSP kit database : http://www.largescaleplanes.com/kitdb/details.php?kit=1420. The pic in the database is actually the one I did of my kit. Some vacform sheet, some (rough to very rough) resin details, some resin struts, et voilÃ ! A quick check has already revealed some potential issues, like the lack of dihedral in the outher wing panels. But I like it rough, don't I ? That's not a kit! Blob of plastic doesn't make it a "kit". Definitely a glutton for punishment. Good luck and I'll be watching! Now we will need to see an S-38 in Hawaiian Airlines livery. That one would need the whole scratchbuilt treatment, but so will this one, as far as we can tell. Thanks for letting us watch your endeavor. Very funny coincidence ! I just looked closely at that aircraft two days ago, as i discovered it in the Combat Model kit list ! I will watch your WIP with interest. Some inspiration for you my Friend! May the zephyr winds carry the project to a happy conclusion! Looking forward to seeing this come together Hubert. Hubert, you are mad! But in the best kind of way. Fantastic project, one of my favorite aircraft! Certainly a great challenge you've set yourself Hubert. I wonder if home-made decals will be the way to go with that crazy giraffe scheme? No pics yet, but I have already hit the first problems. @Torben : I think this will rather be a lot of masking. But the Silhouette will be but to work. Well some pics at last to illustrate my comments. I decided to see whether I could improve the transparency. I sanded the inside with Micromesh, going down to finer grades up to 12000, then polished it with a cloth wheel in the mini-drill and some polishing compound. I could probably get a decent level of transparency, but the part is still not high enough in the front part. The gap is about 3 to 4 mm. and the transparency is needed there down to the fuselage line. It may be operator's error, I am not immune to these blunders. But the gap is too big for that IMHO. As a side comment, the top rear shape of the fuselage on the clear part is wrong. If you have looked Paul's video above, you will also have noticed that the fuselage is straight sided with well defined angles, and strakes on these angles. 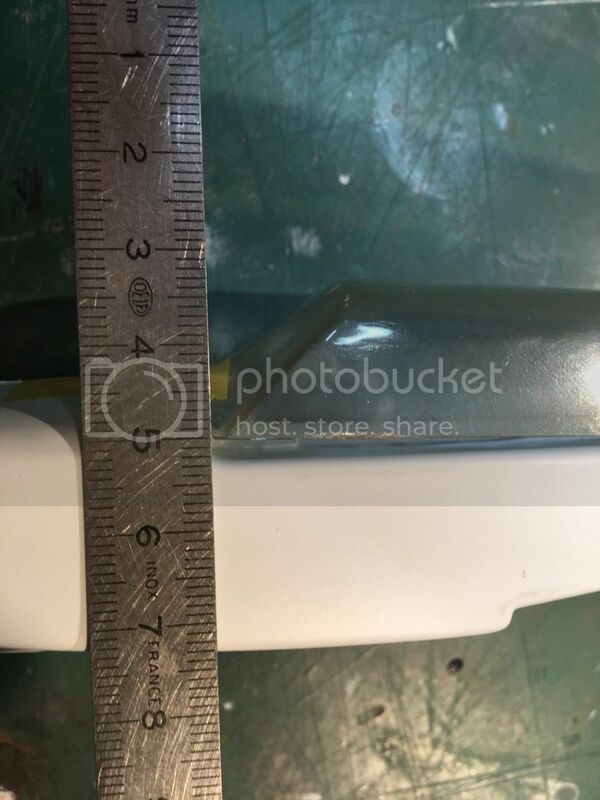 The pic show that the angles of the kit parts are rounded. 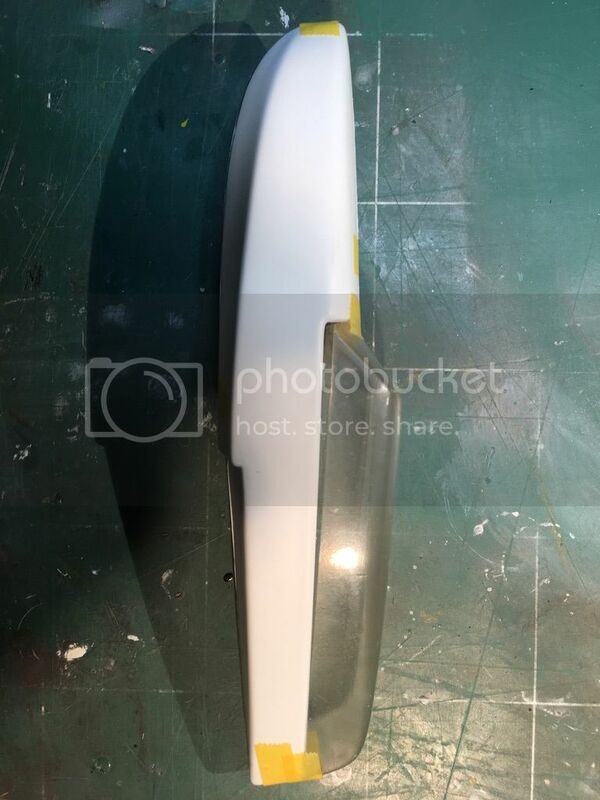 To get them sharper, the parts should have been formed by being sucked-in a female cavity, not wrapped around a male plug ... Of course, I could add filler until the angles are as required, but the work is tedious, and I feel I will be just as well scratching a new fuselage. oehhhh, this is very promising, have fun building Hubert!!!! Oh, give it up.... Go do something easy now! Unreal for sure and it is as close to a complete scratch project rather than a kit.